Speaking of 3D printing, this is pretty amazing: a team of designers and engineers at Disney Research have recently published a remarkable paper entitled "Printed Optics: 3D Printing of Embedded Optical Elements for Interactive Devices." (Just as their amusement parks are located in the family-friendly tourist destinations of Florida and Southern California, the entertainment company's research division is strategically located in close proximity to Carnegie Mellon University and the Swiss Federal Institute of Technology Zürich.) Karl D.D. Willis, Eric Brockmeyer, Scott Hudson and Ivan Poupyrev are based in the Pittsburgh lab, and the highly technical 10-page paper [PDF] is as dense as one might expect. 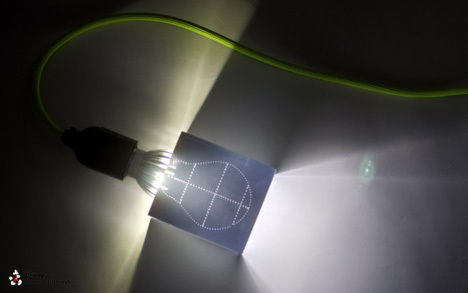 From the Printed Optics project page:Printed Optics is a new approach to creating custom optical elements for interactive devices using 3D printing. Printed Optics enable sensing, display, and illumination elements to be directly embedded in the body of an interactive device. 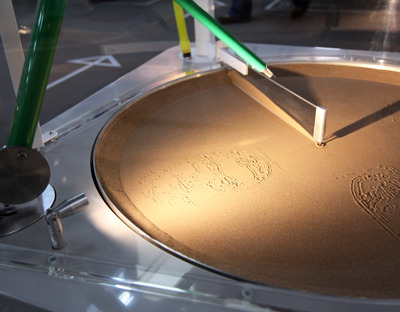 Using these elements, unique display surfaces, novel illumination techniques, custom optical sensors, and robust embedded components can be digitally fabricated for rapid, high fidelity, customized interactive devices. Printed Optics is part of our long term vision for the production of interactive devices that are 3D printed in their entirety. 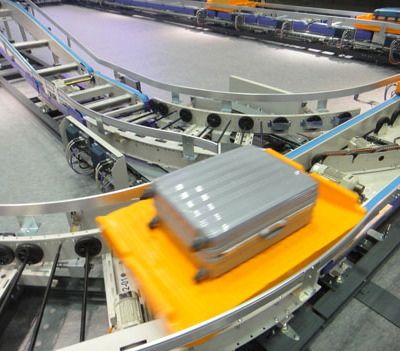 Future devices will be fabricated on demand with user-specific form and functionality. 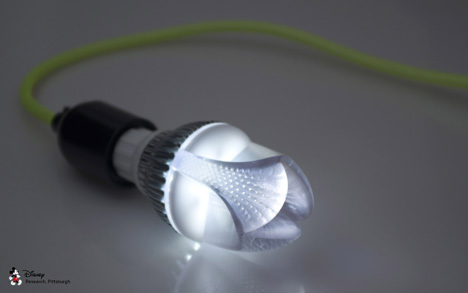 Printed Optics explores the possibilities for this vision afforded by today's 3D printing technology. 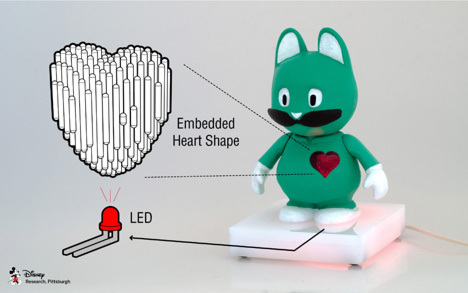 Besides the interactive applications of 3D printed optics, the Disney Researchers have also developed a handful of lightbulbs, an easy metaphor for their insight. ...Optical elements can be fabricated that combine multiple chemically disparate materials in a single model. 3D printers can often use at least two materials simultaneously: model material and support material. Model material constitutes the main model itself and support material is used as a sacrificial material to provide structural support under model overhangs and in hollow areas. Typically, support material is removed and disposed of once the printing process is finished, but can also be embedded inside the model to guide, block, and diffuse light. A third 'material' that can be utilized is air, hollow pockets of air can be used to guide and reflect light in a similar manner to mirrors and beamsplitters. 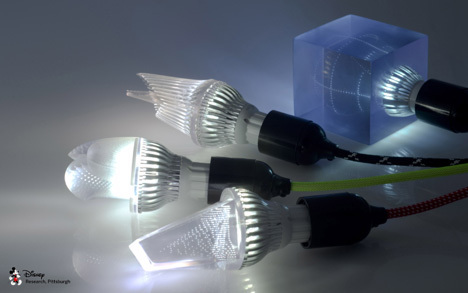 Advanced 3D printers can combine opaque materials with optical quality transparent materials to mask and block light. 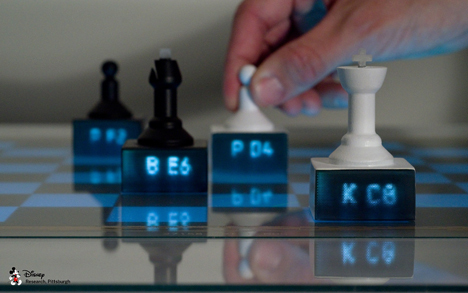 "Chess pieces with embedded light pipes display content piped from an interactive tabletop. Contextual information, such as chess piece location and suggested moves, can be displayed on each individual piece." 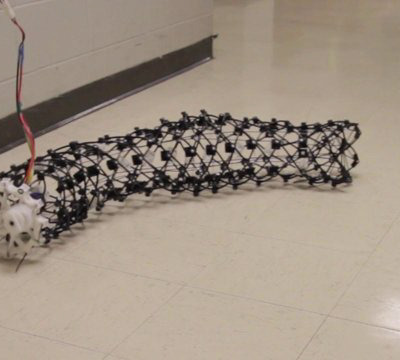 "3D printed light pipes can create display areas on physical objects, by guiding light from regular screens." 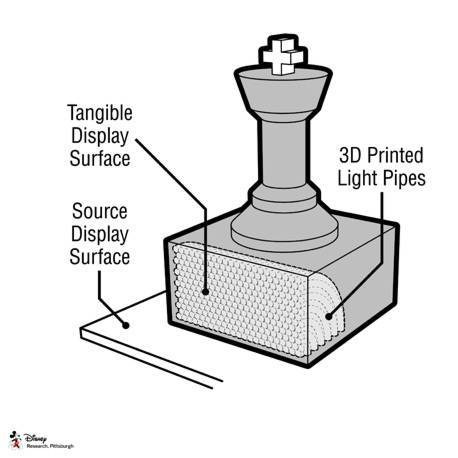 The Disney Research team have implemented the new advances in 3D printing technology to digitally fabricate 'light pipes': "3D printed optical elements, similar to optical fiber, that can be used to guide light from point to point." 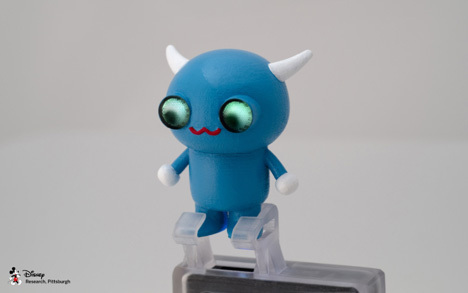 "A four-way button with sensors embedded inside the 3D print." 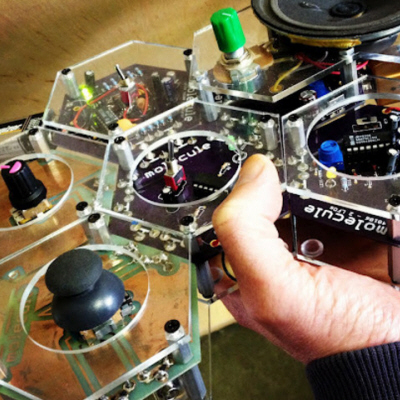 Maker Faire New York 2012 Preview: Interview with Travis Feldman of Molecule Synth + Ticket Giveaway!